The pioneer spirit of the Little House series lives on in this picture book biography perfect for young readers! Readers around the world know and love Laura, the little girl born in the Big Woods of Wisconsin and raised in covered wagons and on wide open prairies. Now Little House fans can learn more about the remarkable story of the pioneer girl who would one day immortalize her adventures in the beloved Little House books in this, the first picture book biography book of Laura Ingalls Wilder. With simple, glowing text by noted historian and Little House scholar William Anderson, and beautiful paintings by Dan Andreasen, Pioneer Girl is a very special portrait of a writer whose classic books and pioneer adventures have made her one of the most popular literary figures in America. Readers around the world know and love Laura, the little girl born in the Big Woods of Wisconsin and raised in covered wagons and on wide open prairies. Now Little House fans can learn more about "Half-pint" in this, the first picture book biography book of Laura Ingalls Wilder. With a simple, glowing text by noted historian and Little House scholar William Anderson, and glorious paintings by Dan Andreasen, Pioneer Girl is a very special portrait of a writer whose classic books and poineer adventures have made her one of the most popular literary figures in America. This picture-book biography of Laura Ingalls Wilder tells the remarkable story of the pioneer girl who would one day immortalize her adventures in the beloved Little House books. Written in simple, glowing text by noted Little House scholar William Anderson, and illustrated with glorious paintings by artist Dan Andreasen, this wonderful first biography captures the very essence of the little girl called ‘Half-pint,' whose classic books and pioneer adventures have made her one of the most popular literary figures in America. This picture-book biography of Laura Ingalls Wilder tells the remarkable story of the pioneer girl who would one day immortalize her adventures in the beloved Little House books. Written in simple, glowing text by noted Little House scholar William Anderson, and illustrated with glorious paintings by artist Dan Andreasen, this wonderful first biography captures the very essence of the little girl called ‘Half-pint,’ whose classic books and pioneer adventures have made her one of the most popular literary figures in America. Was not what we were expecting. I guess I should have researched more, but this is like a brochure. Not much to read in the book. It if definitely geared towards kids, but we were looking for perhaps a different book that goes into her life more. 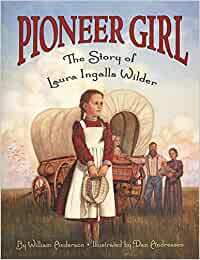 Great for introducing Laura Ingalls to my third graders. Nice drawings too. The book was not that big in pages. Was sort of disappointed. I expected a novel & got a small book. Was not worth the price I paid. The wife says I got the wrong thing here. But it was the thought that counts. This picture book is a compacted synopsis of the life of Laura Ingalls Wilder, from her birth in 1867 to her death in 1957 at age 90. Children who are familiar with some or all of Laura's stories (or the TV show) will delight in hearing of her entire life. I have yet to meet a child who does not delight in Laura's life and stories. Even if a child has read the Little House series of books, there is something new to learn here as her life continued beyond what we know from the Little House series. There is a greater amount of text per page than in most picture books; perhaps explaining why the publisher has determined this is for a 9-12 age range. However, the font size is quite large and the language and information is so watered down that a 3 or 4 year old could understand it. What suffers here is the illustrations. The illustrations sometimes are of a more boring scene in the opposing page than could have been chosen. For example one page shows Laura and Mary doing homework at the kitchen table and while that is a part of the opposing pages' text, so is the more dramatic story of a terrible blizzard, which forced the family and other families to live together in the town building. While the people were starving, two boys (one being Almonzo Wilder) risked their lives by braving the storm to get food for everyone, not only surviving themselves but saving the lives of the townspeople. It seems to me that this exciting story would have made a better illustration. As a read aloud, my two boys aged three and five sat quietly to listen to this story, they are familiar with the Little House chapter books and with the reruns of the TV show from the 1970s. They both enjoyed this story, as did I. If you want more details of Laura's life I advise you to read the entire Little House series of chapter books. I feel that children as young as 2.5 or 3 enjoy that series of books as a read-aloud. There are also books on the market that discuss Laura and her daughter Rose's life in much more detail if you are interested. There are also craft books and cookbooks as a companion to the Little House series. This book summarizes Laura's life, explains the values and commitment they all shared, and expresses the difficulty of life in Pioneer Days. It is interesting for both Laura-fans and for anyone interested in learning about life in the American Pioneer Days. 5.0 out of 5 starsBeautiful Book! This really is an outstanding and quite beautiful picture book! I never really read the Little House books as a kid. But I'm inclined to now. This IS a great prelude to those books. Incredible illustrations! Bill Anderson has done a wonderful job of telling the story of Laura Ingalls Wilder that can be read and enjoyed by both children and adults. Dan Andreason's illustrations are absolutely beautiful and complement Anderson's story very well.